Ever since Montréal-based Cirque du Soleil double-back-flipped onto the world stage with its high-flying brand of entertainment, the number of similar performance troupes has exploded. Cirque Éloize, Cirque de la Symphonie, Cirque Berzerk and countless other shows incorporate not only the word “cirque” in their name but many of their namesake’s stylistic elements, too. In a word, circus is hot. But, says Giovanni Zoppé, leader of the Zoppé Family Circus, none of those troupes are “real circus.” Real circus, the 45-year-old explains, is what his troupe does and has been doing since his forebears started doing it in Italy 169 years ago. Drawing inspiration from the Venetian commedia dell’arte of the 16th and 17th centuries, the 28-person circus doesn’t make use of loud music, elaborate costumes, over-the-top makeup or Hollywood-esque production. Instead, the Zoppé circus focuses on traditional acts — horses, dogs, aerials and, of course, clowns. But not the kind with huge wigs, floppy shoes or oversize bow ties. 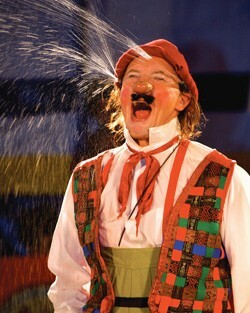 Zoppé, who has played Nino the Clown since he was 10, says his group’s clowns are direct descendants of classical European stock. It’s not just performance style that makes the Zoppé circus stand out from its nouvelle-cirque contemporaries. Half the troupe is related, which means that Zoppé goes to work every day with his mother, wife, siblings, cousins and even his 22-month-old son, Julian. Until a year and a half ago, when he passed away at 88, Alberto Zoppé, patriarch and revered circus performer, entertained the crowd as the de facto ringmaster. The elder Zoppé, who first came to the United States in 1948 to perform in Cecil B. DeMille’s movie The Greatest Show on Earth, was known for being able to do a layout somersault from the back of one moving horse to another. By the 1960s, he had revived the troupe he left in Italy, and the circus’ current American incarnation was born. Giovanni Zoppé spoke to Seven Days by phone from Westhampton, N.Y., where the circus performed recently, about real circus, working with family and doing what you love. SEVEN DAYS: When did you get involved in the circus? Were you part of it from the time you were little? GIOVANNI ZOPPÉ: Yes, I’ve been involved since I was my son’s age, but I actually started in the ring when I was 6 years old. SD: Was there ever a thought that you might do something besides circus work? GZ: No, this is my life. This is my choice. I have tried other things when I’ve been off and I’ve been home. Once I worked at a truss shop building trusses for houses. And that lasted about two weeks. The next year I went back and tried it again and started working in deliveries for a construction company, and that lasted about six days. I was like, You know what? I can’t do it. I love what I do, and I’ve got to do it. SD: What do you love about it? GZ: I love looking out into my audience’s eyes and looking at parents and children and teenagers and babies, and they all have the same expression on their faces of joy and disbelief of what we’re doing to them. Bringing joy to people is very rewarding. SD: What I find interesting about your circus is that it’s very traditional, and it doesn’t employ the bells and whistles of technology and music and Hollywood production. It seems really close to what original or real circus was like. Is that accurate? GZ: That’s our goal — to be as real as possible. We’re proud of the fact that we have no flashing lights or fog machines or girls in costumes so skinny you can’t even see them. People with makeup so thick you can’t even see the artist. We’re human beings, and we’re inviting people into our living room. SD: Except that your living room is a gigantic tent. SD: Why the tent? Couldn’t you perform in a theater, like some other circus shows? GZ: Well, that’s not true that some circus is performed in a theater. Most circus shows that are done in the theater are called Cirque something, and they’re just copycats of Cirque du Soleil. They have anywhere from three to 12 artists, and they’re good gymnasts. But a true circus has horses and dogs and comedy and aerial and emotion and feeling and family. Without family, there is no circus. When you change the name to Cirque to sell tickets, you’re taking that element of family away from what circus is supposed to be. That’s why we aim to be what circus was a hundred years ago. Nothing flashy, no smoke and mirrors. It’s all right there for everyone to see. SD: What is the appeal of the Zoppé circus? GZ: It’s welcoming. Like you’re coming home when you come in our tent. Before our shows start, all of our artists are outside of the tent welcoming people, just as you would welcome guests at your front door. As they exit, we say goodbye to them. We walk them to the door and say good night. It’s a family affair. It’s not a huge spectacle like some of the larger, if you want to call them, circuses. SD: What is it like working with your family? GZ: It’s a family. So what’s it like being in a family? You struggle and you complain and share joys, and you sit down at the table to eat at the end of the day. It has its challenges. That’s what comes out in the show a lot. But we work together as a family unit. Without a family, like I said, there is no circus. There are joys, and then there are times when it’s like, Why am I working with my family? It’d be much easier to work at McDonalds. SD: Have you ever gotten hurt performing? GZ: I’ve had two knee operations, two shoulder operations; I broke my spleen. But the worst thing that ever happened was I fell off the trapeze and landed on my head and was in a coma for four days. The first question everyone asked when I was OK was if I was going to go back up. There was never a thought of not going back up. It’s my life. You’re not going to stop driving a car because you get in an accident and have a concussion. It’s my life; it’s what gives me joy. SD: Has the circus been operating continuously since 1842? GZ: There have been some days off [laughs]. When my father came to the U.S. in 1948, it took some time to get it up and running again. Has it been continuous since 1842? I guess I can’t say that. But it’s always been a part of our family. SD: And it managed to continue through both World Wars. GZ: My father used to tell us a story that during the war they were performing for the troops at a USO event. So they would go to different army bases and perform, and he said one time the German planes started flying over and shelling, and all the circus people ran into ditches. They bombed the circus, and it was all up in smoke. And when the artists came back, all the animals had been trying to get out of their cages and couldn’t and burned to death. SD: Most people would have packed it up after that. GZ: But you can’t. That little girl in the front row has magic in her eyes. That’s what it’s for. My father was never a millionaire. We struggled horribly when I was a child. And we still struggle today. Zoppé Family Circus, Technology Park, South Burlington. Thursday and Friday, August 4 and 5, 6 p.m.; Saturday and Sunday, August 6 and 7, 11 a.m. and 6 p.m. $15-20. Tickets, 863-5966 or flynntix.org.